Time just seem to fly by? Another year gone before you know it? Want to reach back and grab on to one that got away? 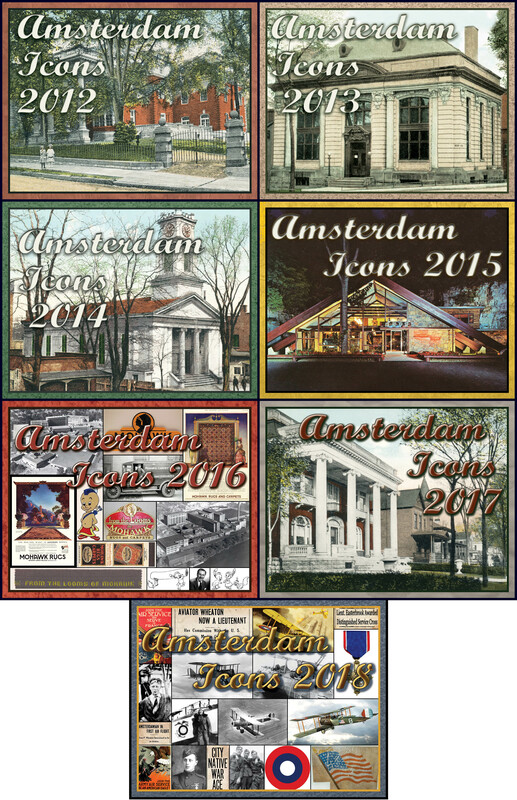 Each year since 2011 the Historic Amsterdam League has introduced a new Amsterdam Icons calendar for the coming year themed to some aspect of Amsterdam history. SOLD OUT Amsterdam Icons 2012, the inaugural edition, featured illustrations originally appearing on Amsterdam postcards from the early 1900s, from churches and hospitals to mansions and mills, symbolizing important aspects of living and life in the city. Amsterdam Icons 2013 continued the previous year’s theme, providing more iconic images of what was once the fabric of Amsterdam, some remaining as tangible links to the past, others surviving only as fading memories. The centerfold feature examined the creation of the Amsterdam Free Library. Amsterdam Icons 2014 was populated with monthly images of past and present Amsterdam houses of worship. The two-page centerfold contained a photo feature of additional Amsterdam churches, many lost through the years to time and progress. SOLD OUT Amsterdam Icons 2015 showcased Amsterdam area eateries of the past, evoking memories of good times and special occasions shared with family and friends. The centerfold was a montage of historic newspaper dining advertisements. Amsterdam Icons 2016 brought a montage theme to the monthly illustrations with images and symbols telling the stories of industries from Amsterdam’s past along with a centerfold of rare mill photos and discussion of the city’s industrial history. Amsterdam Icons 2017 was illustrated with images of the grand homes and mansions that lined Amsterdam’s boulevards in the city’s golden age of business and industry. Many of the magnificent old homes gracing the months and centerfold still remain, others belong to history. Amsterdam Icons 2018 explored the year 1918 and what was going on in our city a century ago. World War I in Europe and at home, the impact of the influenza epidemic, local reaction to the prohibition movement, the new automobiles, and the most popular silent movies – an interesting time in Amsterdam. All of HAL’s Amsterdam Icons calendars are full color, 11 x 17″ wall-size, professionally printed on heavy stock, and filled with frame worthy pictures. Get the one you missed, add to your HAL history collection, or save a few bucks and get one now to use next time the same year comes around again! Please be sure to specify the calendar year(s) and quantity with your order.